Cumin (Cuminum cyminum) is a popular spice that is native to areas in the Middle East and India. The flowering plant is a member of the parsley (Apiaceae) family and it produces seeds that are either ground into powder or used whole. Cumin has been used for centuries as both a flavoring agent and as a preservative. Some believe cumin benefits the body and can even boost weight loss, although not all of these uses are supported by science. 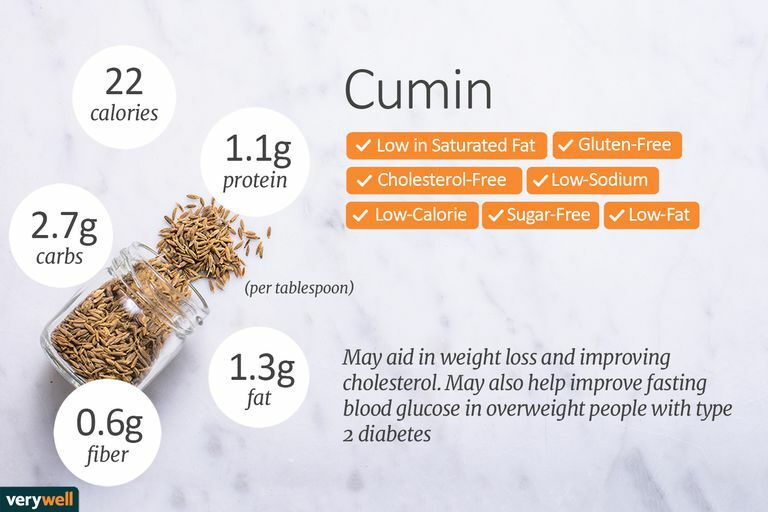 While many cooks use cumin to flavor Tex-Mex style dishes and other ethnic cuisine, others use cumin to treat a broad range of medical conditions including gas, bloating, and diarrhea. The spice is sometimes taken orally and used as a stimulant or an aphrodisiac. Others use cumin to stimulate menstrual flow or to treat colic in babies. However, there is no clinical evidence to support the use of cumin for any of these uses. There is some limited information suggesting that cumin may provide weight loss benefits. In one study of overweight and obese women, researchers found that cumin powder supplementation (3 grams per day) was able to enhance the effects of a reduced calorie diet for weight loss. Another analysis of studies suggested that various levels of cumin supplementation may be able to improve body weight, body mass index (BMI) and fasting blood glucose in people who are overweight and have type 2 diabetes. Lastly, in a published analysis of studies, researchers found evidence supporting the use of cumin to lower both total cholesterol and LDL cholesterol. Subjects in different studies consumed either cumin powder (3 grams), cumin extract capsules (225 to 300 mg/day), or cumin essential oil capsules (25 to 100 mg/day) to gain a positive effect on blood cholesterol levels. Study authors concluded, "This systematic review with meta‐analysis indicated that cumin supplementation can be considered as a safe therapeutic option besides statins and other routinely administered lipid‐lowering agents." It is important to note that black cumin (Nigella sativa) and black seed oil (that is extracted from black cumin seed) is also used for medicinal purposes, some of which have been supported by clinical studies. However, even though black cumin shares a similar name with cumin, it comes from a different plant and is a different substance. There are almost no calories in ground cumin. If you add the spice to recipes in typical amounts, the spice will not add calories, carbohydrates, protein, or fat to your diet. If you use cumin seed, a single serving will add a few calories to your daily total. One tablespoon (about 6 grams) of cumin seed provides about 22 calories. According to USDA data, most of the calories come from carbohydrate (3 grams), primarily in the form of fiber. There is also a small amount of protein (1 gram) and fat (1.3 grams) in cumin seed. A tablespoon of cumin seeds will also provide some vitamins. You'll benefit from a boost in vitamin A (2 percent of your recommended daily intake), vitamin C (1 percent), riboflavin, niacin, and vitamin B6 (1 percent each). You'll also get 1.5 grams of choline. Minerals in cumin include calcium (56 mg), iron (4 mg), magnesium (22 mg), phosphorus (30 mg), potassium (107 mg), sodium (10 mg), and small amounts of zinc, copper, and manganese. Ground cumin is easily found in most grocery stores. Cumin seeds, however, may be more difficult to find. The seeds (which closely resemble caraway seeds) may be found in specialty markets and gourmet shops. Store ground cumin or cumin seeds in a cool, dark, dry space such as a cupboard or cabinet that is away from the stove. Ground cumin should stay fresh for about six months. Cumin seeds stay fresh for about one year. Cumin is a common ingredient in many Mexican-style, Indian, and Middle Eastern dishes. Try any of the following recipes to enjoy the flavor of cumin. Researchers who study cumin supplementation note that the spice is generally well tolerated and test subjects who consume the spice generally do not report adverse effects even when used long term. However, scientists in one published report caution that chronic consumption of cumin can have some side effects including the increased risk of bleeding, respiratory complications, and dermatitis. They write, "pregnant and breastfeeding women, as well as patients with respiratory diseases or ulcer, must take caution when using it. Also, it interferes with some medications such as antibiotics, antiseizure, antidiabetic, and anti‐inflammatory agents, so it must be prescribed by a physician." What does cumin taste like? Cumin has a warm, nutty flavor. The reddish-brown ground spice is also described as earthy and spicy. ﻿What is a suitable cumin substitute in recipes? Cumin is found in curry, so curry may be a good cumin substitute if you don't have any on hand. Also, some cooks use ground caraway seeds, ground up coriander, or even chili powder in recipes instead of cumin. Cumin Full Monograph. Natural Medicines Comprehensive Database. 08/15/2018. Nigella Sativa. Memorial Sloan Kettering Cancer Center. About Herbs, Botanicals, and Other Products. August 29, 2014. Jafarnejad, S., Tsang, C., Taghizadeh, M., Asemi, Z., & Keshavarz, S. A. (2018). A meta-analysis of cumin ( Cuminum cyminim L.) consumption on metabolic and anthropometric indices in overweight and type 2 diabetics. Journal of Functional Foods, 44, 313–321. DOI: 10.1016/j.jff.2018.03.026. Hadi, A., Mohammadi, H., Hadi, Z., Roshanravan, N., & Kafeshani, M. (2018). Cumin (Cuminum cyminum L.) is a safe approach for management of lipid parameters: A systematic review and meta-analysis of randomized controlled trials. Phytotherapy Research, 32(11), 2146–2154. DOI: 10.1002/ptr.6162. Zare, R., Heshmati, F., Fallahzadeh, H., & Nadjarzadeh, A. (2014). Effect of cumin powder on body composition and lipid profile in overweight and obese women. Complementary Therapies in Clinical Practice, 20(4), 297–301. DOI: 10.1016/j.ctcp.2014.10.001.